Today I bring to you a celebration of a different sort. Not a soiree in honor of a holiday, a birthday, or any other calendar-specific date, but instead, a celebration of vegan food and the joy that is sharing it with friends. I am beyond lucky to work with dozens of compassionate, kind vegans. No, not everyone at my organization is veg, but those of us who work there for the mission are almost invariably somewhere on the vegan-vegetarian spectrum. We also have a vegan food policy at work, so that everything people bring in to share should be animal product-free. As such, I’ve found myself in so many situations on the job where I feel like I need to pinch myself: Am I really getting served adorable vegan tarts at a work meeting?! Is a brand-new vegan food truck actually going to stop by the office every Wednesday during the summer?! Did that amazing vegan ice cream company truly just drop off dozens of pints for us to try?! All real examples, and all amazing. But what’s also amazing is getting to hang out with all those compassionate vegans off the job. Many of our gatherings center around food, whether it’s a friend teaching a small group how to bake with a sourdough starter or Steven’s and my (dare I say it?) legendary vegan holiday parties. 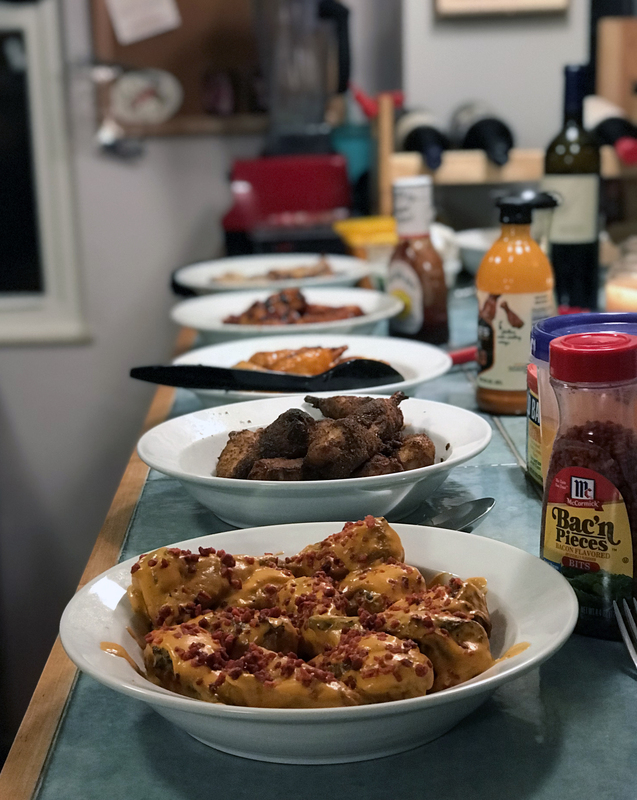 So it was not at all surprising to me when my coworker Kristen recently threw an all-vegan wing night at her house. And it was even less surprising when the invitees responded not just with a yes, but with the dish they’d bring to share. 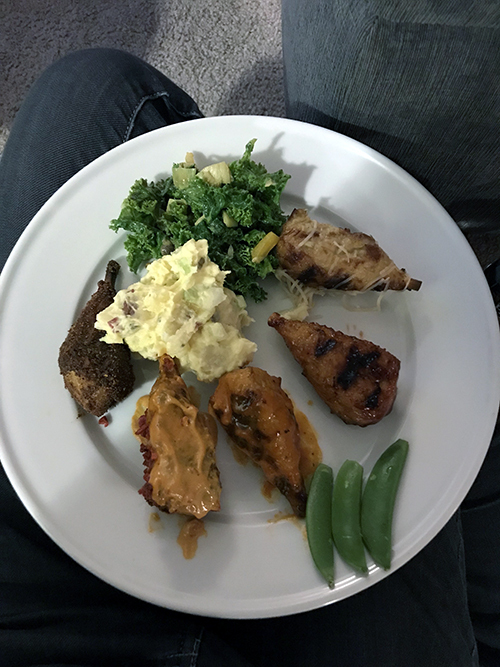 I made sure to load up my plate with one of each flavor, along with some of the salads and a few crudites for crunchin’. (I’d done lots of snacking on the chips and dip before wing time.) All the wing flavors were drool-worthy, but the garlic parmesan won my heart (and tummy). Stevie used Earth Balance and Follow Your Heart’s vegan parm shreds to make a buttery, rich, cheesy, garlicky wing that was comfort food at its best. I need to get me a package of drummies to recreate this one! Needless to say, this group of hungry vegans devoured the wings and the accompanying sides and snacks. We rounded out the night with games galore: Connect Four, Jenga, Scattergories. I left around midnight, an unheard-of time for a Friday night. I’m usually exhausted on Fridays, preferring my nights out to take place on Saturday after I’ve recovered from the work week. But this late Friday was totally worth the tiredness. In fact, I’d say vegan wings are always worth it. Can I work with you? ^__~ This looks awesome. I’ve been wanting to try May Wah, but I’ve been too lazy to drive into Philly to one of the grocery stores that carry them. I also feel like I need to save a bunch of bucks and free up some freezer space before I go lol. These drum sticks will be on my “to buy” list. Everything about this post is amazing and has made me really jealous! I have a new colleague who is vegan,which means a grand total of two of us, and I’ve been blown away by how great it is to have a like-minded person around to have lunch and snacks with. Imagine having a whole office like that! Even just one person makes a huge difference! That’s exciting for you!